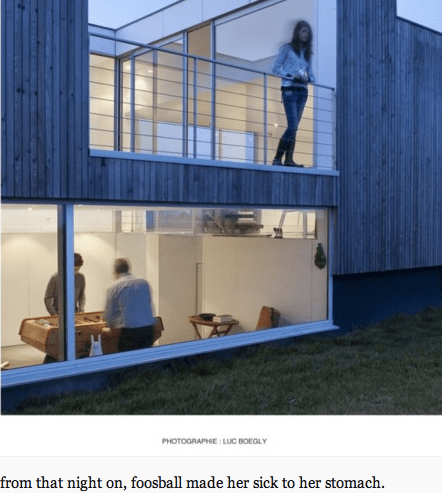 Today Very Short List pointed us towards a site called Unhappyhipsters in which images like the one above are fetched from the pages of Dwell magazine and then given small narrative indicators that give them new meaning. "It become their routine…" Wonderful. Last week, on the post on Significant Objects, I contemplated a commercial world in which new products came with narratives attached, new meanings, which we could use to reimagine our present circumstances. I just bought a new bag from Tumi. My last one gave up the ghost last week in Seattle. I like the idea of getting messages from Tumi as it imagines the things that are or could be happening to me. With a link to my TripIt file, Tumi could know where I am, even, if I allowed it, what hotel I was staying it. With GPS location permission, I could have a rough idea of my circumstances. All of this data makes it possible to feed me a stream of narrative suggestions that are plausible at least by time and place. Oh, alright. This isn’t quite right. But the idea remains promising. Consumer goods, thanks to brands and meaning makers in the world of marketing, have always come with meanings. And they will continue to do so. But in addition to these quite general meanings, it is possible for the brand to communicate many more particular meanings. As long as they some how resonate with what is happening in my life, they will be interesting and fun. Animating, actually. "We have writers standing by!" When does this become a brand promise? The Very Short List treatment is here. The Unhappy Hipsters website is here. This entry was posted in Uncategorized and tagged branding, Dwell Magazine, marketing, meaning manufacture, new meaning manufacture, Significant Objects, Unhappy hipsters, Very Short List on February 1, 2010 by Grant.